My office in Coral Gables overlooks a waterway, and when the temperature drops during winter months, groups of giant manatees glide quietly into our canal . These gentle creatures are a welcome sight – and give me a great excuse to run outside with my camera. I love manatees! They’re bulky but graceful, and rather strange looking as they float along with only their massive nostrils visible. Watching a family of “sea cows” laze and frolic in the warm waters, I can’t help but smile. Remember to come up for air. Do you ever get so busy with life, with work stuff, with “to-do” lists, that overwhelm sets in and the joy of life is sucked right out of you? 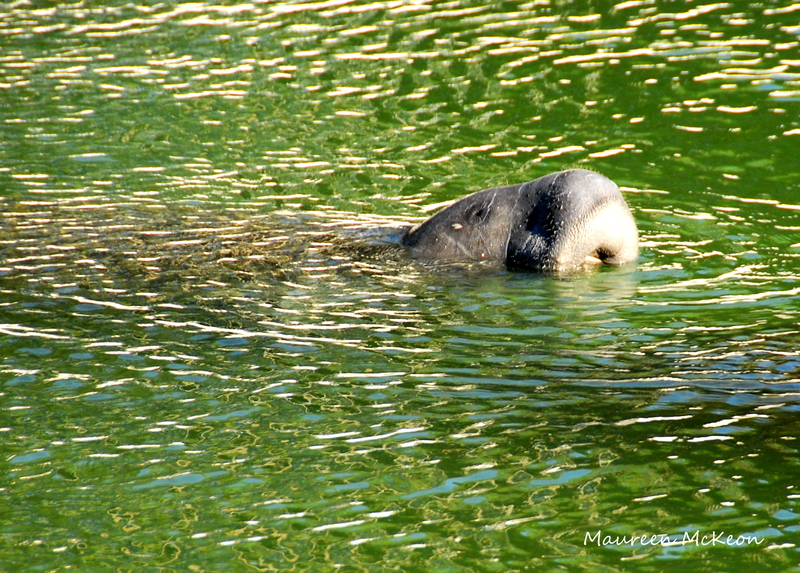 The manatees remind us to come up for air! It’s time to stop the busyness, get up from your desk, take a walk outside and breathe deep. Look up at the sky and notice the clouds. Feel your lungs expanding. Look down at the grass beneath your feet. Feel grounded? Once you clear your head and get a new perspective, you’re ready to dive back in…lighthearted now, full of grace. Stay tuned for Lesson from a Manatee, Part Two. I forget all about the stress of driving to Coral Gables when they show up in our canal! Wouldn’t the world be a better place to live in, if we all took time to come up for air and looked around.